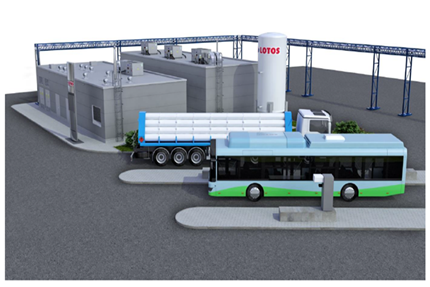 Grupa LOTOS and LOTOS Paliwa will obtain EU funding for their project to construct hydrogen purification and distribution units and two hydrogen refuelling points (in Gdańsk and Warsaw) as part of the Connecting Europe Facility (CEF). The project, worth almost EUR 10m, is to be placed in service in 2021. The ‘Pure H2’ project submitted by LOTOS was placed on the list of projects approved by EU member states in late September and supported as part of the CEF instrument (specifically in the 2017 CEF Transport Blending MAP Call II). This means that almost EUR 2m, i.e. approximately 20% of the project budget, will be provided by the EU. The objective of the project is to launch the sale of ultra-high purity hydrogen (99.999%) which could be used primarily as a fuel in public transport vehicles. Hydrogen allows vehicles to cover the distance of as much as 450 km without the need for additional charging. The use of hydrogen also makes it possible to spend less on additional power grid infrastructure. The project envisages the construction of a hydrogen purification unit at the Gdańsk refinery and a hydrogen sale and distribution station in the immediate vicinity of the LOTOS Group’s plant, as well as two refuelling points (in Gdańsk and Warsaw).